October 5, 2018 Greyhawk GrognardUncategorizedRPG, World of Greyhawk, WotC8 Comments on What is Canon? This conversation keeps coming up, over and over, in various online fora, and it’s about time to set the record straight on just how canon works, who gets to decide whether something is canon, and whether what you personally think should be canon, or whether what you do in your own game has anything to do with the question. Religious overtones aside, it is definition a, “an authoritative list of books” which concerns Greyhawk. That is, it is the list of books, modules, boxed sets, etc. which are deemed to be authoritative for the World of Greyhawk Fantasy Setting. In order for a list of books to be authoritative, however, we must look to what person or body has the authority to declare something authoritative. In modern society, that is the individual or corporation which owns the Intellectual Property (IP) in question. And that, my dear readers, is Wizards of the Coast. It should be pointed out that the same general theory applies to a variety of other well-known IP. For example, Star Wars is owned by Disney, which gets to decide what is and is not canon. Notably, that changed dramatically when Lucasfilm sold Star Wars to Disney, and the entire Extended Universe was suddenly declared to no longer be canon. Disney could do that, because they were the authority who could create the “authoritative list” of works that made up the Star Wars canon. In exactly the same way, Wizards of the Coast gets to decide what is and is not canon for its various settings, including the World of Greyhawk, because they own the IP. Let’s run through some of the implications of this. So please, when the question of whether something is canon comes up, stop saying “Well, in MY game…” because it’s entirely irrelevant. Ahem. It also means that not everything that is published by the owner of the IP, or even with their authorization, is necessarily canon. Recall the example of Disney and the Star Wars Expanded Universe. Comic books do this all the time, with Marvel at one time even having a book titled “What if?” which explored a bunch of neat scenarios like “What if Doctor Doom became a hero?” None of them were canon, obviously, but they were still published by Marvel. But they could, if they chose, change that, and declare that “What if Daredevil became an agent of S.H.I.E.L.D. ?” really was canon. They own the IP, they can do with it what they want in terms of making it canon or making it not-canon. Another implication is that the original creator of the IP does not always define canon. This stems from the fact that the ownership of IP can change hands, and the original creator(s) can transfer their ownership (and thus the power to decide canon) to someone else, or some corporation. Again, this happened with Lucasfilm and Disney, and Gene Roddenberry and Star Trek, but it also happened with Gygax and Greyhawk. When Gygax left TSR in 1985, he transferred ownership of The World of Greyhawk Fantasy Setting to TSR, which later passed to Wizards of the Coast. That means that from that moment on, nothing he wrote in the setting was canon. This includes most specifically the Gord the Rogue books that were published by New Infinities (but not the first two Greyhawk Adventures books, which were published by TSR). Like it or not, “Greyhawk Ruins” is the canonical version of the dungeon, not Gary’s original, not the one he and Rob Kuntz did together, not Castle Zagyg, and not Castle of the Mad Archmage. Now, this brings us into less well-charted territory. Let’s start with the RPGA and Living Greyhawk. The various Living Greyhawk modules are easy to sort out. They’re not canon, period. This is true because Wizards of the Coast doesn’t own them. So, barring some grand gesture on their part unilaterally declaring them to be canon, they’re not. And that would be exceedingly dumb on their part, not only because the quality was (to put it charitably) uneven, but they are largely unavailable today, so it would make it impossible for anyone, even Wizards of the Coast, to truly say if a given character or magic item or something was part of Greyhawk Canon. But what about the stuff they did publish themselves, and to which they still have the rights? Like the Living Greyhawk Gazetteer, the Living Greyhawk Journal articles that were included in Dragon magazine, and the online Living Greyhawk documents that remain on their website to this day? Let’s go further. What about the “joke” module Castle Greyhawk? Or the inexplicably eccentric Fate of Istus? Or the officially authorized third-party graphic novel Vecna: Hand of the Revenant? Which of the three published versions of the Against the Giants series of modules is the official one? What about modules that are universally despised, like Puppets? Truth is, we don’t know. To my knowledge, Wizards of the Coast has never, even casually, made any official proclamation about the canonicity of anything. Without some sort of authoritative list from the owner of the IP, it really is impossible to state with 100% certainty what is and what is not “Greyhawk Canon.” Maybe someday they’ll come out with such a list, and these interminable discussions online can end, so we can make room for other interminable discussions. 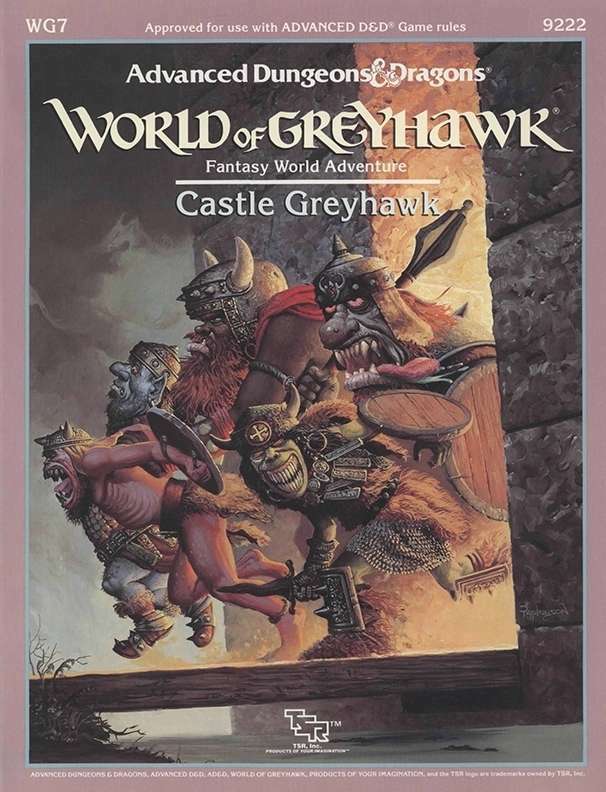 My suspicion, and probably WotC’s best approach unless and until they start publishing material for the setting again, is that nothing is canon for the World of Greyhawk. That is, there is a bunch of stuff which DMs can choose from to use at their table, plus they can make up their own things at will. Really, the only purpose of canon is to outline what is acceptable for official publication, to serve as a guide for secondary creators so that they don’t contradict previously published material too much. Fans can witter on about details all they like, but canon isn’t really for them. It’s a “series bible”, not Holy Writ to be studied and minutely dissected. For a roleplaying game, the main reason for fans to interact with it at all is to help guide what happens at the table, but in that location the details of what is “canon” are entirely the province of the DM. Thank you for this! I do almost nothing in Greyhawk beyond what was in the City of Greyhawk boxed set, so I know “my Greyhawk” has nothing to do with canon. But I do wonder on that question when I see really well put together material online. I feels like WotC just got muck all over the Greyhawk IP and instead of cleaning it off (settling potentially legal issues over authoring fees, maybe?) they put it up on a venerated shelf and dumped out the Forgotten Realms playset in the front room. But why grant the premise that canonicity (a plainly non-legal concept) is necessarily determined by whoever holds the rights to the IP? Why confuse authority (in its original sense of being determined by the author) with the *legal* right to control a property? By that logic, if the Tolkien estate fell into the hands of the Pokemon owners, by your logic, they could declare Middle Earth part of the Pokemon universe. Which, sure, they could do to flog more merchandise. But in what sense would a Tolkien fan be bound to accept it? In the case of Greyhawk, as with Middle Earth, it seems to me the only folk who could determine the canonicity of particular works are dead and gone. Why buy into the copyright myth that somehow their creative authority lives on? I know you and I are coming from two very different places, you as a publisher of several fine products and myself as referee of my own version of whatever I am running. From where I sit, canon, if the term applies at all, is what the referee says it is. It seems out-of-place to question a referee during the game about some aspect of the shared fiction being gamed at that particular table. Perhaps a discussion afterward, over a beverage, regarding “official” verses “in game”, can extend the shared fun, but during the game, I strongly believe in going with whatever the referee says. Settings are either published for use at the table, or to be read and committed to memory for what other reason? Respectfully, perhaps I am missing the point. Alas, it seems I have utterly failed in my attempt to communicate my intention, because you have so utterly failed to comprehend my meaning. I take all the blame on myself. But, and this is the critical point, the fact that canon is regularly (and necessarily) overridden at each and every DM’s table doesn’t mean that canon doesn’t exist! Canon is the starting point. It ends at the edge of every gaming table, the moment any DM invents a new NPC innkeeper. It’s not supposed to be a constraint on the DM, it’s supposed to be the foundation on which each DM builds. So I don’t disagree with your scenario. I would say it has nothing– at all — to do with the definition of canon. In fact, it is illustrative of the primary misconception about canon, that it is intended to stifle the creativity of the DM. That is not so, in the slightest. It is the common point where all DMs begin, and take their own games in different directions. That I failed to communicate that essential point in my original post irks me no end, as it is precisely what I was trying to get across. As usual, Mr. Bloch, this piece is well worth the read. In distinguishing between what could or could not be considered canon, what would you consider the official timeline to have ended at? For me, it is 591 CY, even if Living Greyhawk advanced things further. The Living Greyhawk Gazetteer was, to my knowledge, the last official WOTC-endorsed publication, so that’s as far as it goes for me. And incidentally, don’t blame yourself for Fred Daniel completely missing your point. Your point was made perfectly clear in the first bold and underlined sentence in the blogpost-and if Mr. Daniel missed that key point, it’s his fault, not yours. I can confirm that EttRoG is a great module. In it, the canon-holder tries to iron out some of the more debatable choices of the past.